- During this period the United States government has not taken a single significant step to reduce hostility towards it in the Muslim world, thereby serving as a continuous de facto recruiting tool for Al Qaeda et al. After all, the best way to reduce the appeal of the most extreme is to meet the concerns of the most rational. - Excessive spending for unnecessary and counterproductive military conflict has done far more damage to the country's fiscal state than Al Qaeda could even imagine. - The dismantling of the Constitution and the steady drift towards a police state damages our safety or freedoms, and supports the arguments of Al Qaeda et al. - Finally, and hardly ever mentioned, the US government has been over three times more deadly to its citizens due to its policies than has Al Qaeda and similar groups. 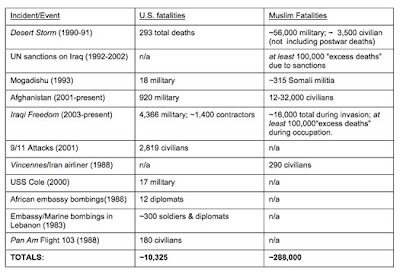 In addition, as this rare and remarkable 2009 chart by Stephen Walt in Foreign Policy illustrates, we have also killed over a quarter million Muslims, hardly a good approach to a safer America. In short, our policies over the past decade have been probably the most counterproductive and damaging to the country we claim to be defending that America has ever pursued.